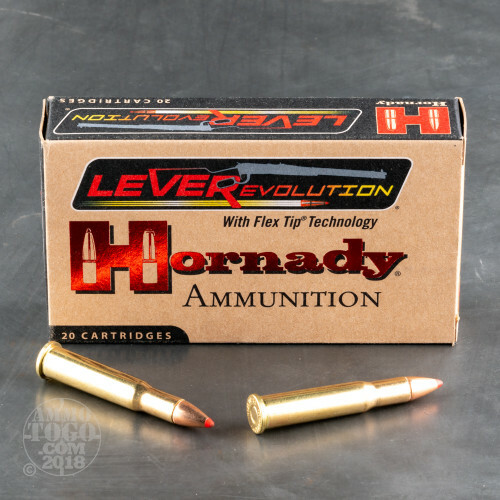 Engineered to deliver maximum performance in lever action rifles and revolvers, Hornady LEVERevolution is completely safe to use in tubular magazines. 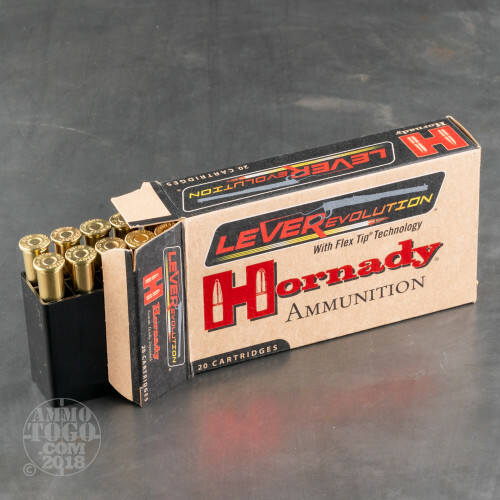 Manufactured by Hornady, a recognized industry leader in innovative ammunition technology, LEVERevolution loads deliver higher ballistic coefficients and impressive downrange performance. 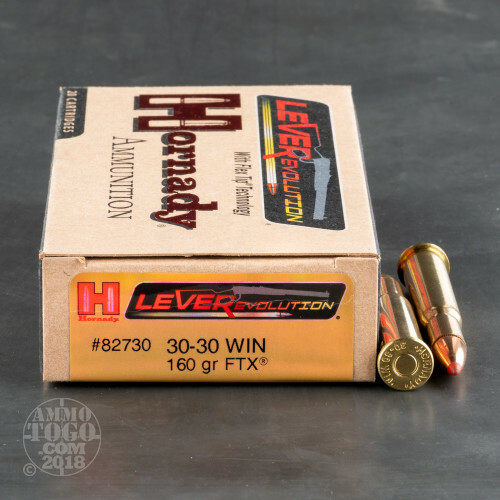 Each of these factory fresh .30-30 Winchester cartridges is loaded with one of Hornady’s patented 160 grain Flex Tip (FTX) projectiles. With unique polymer flex tip points, FTX bullets provide the accuracy, power and long-range performance of a tipped bullet, yet provide smooth feeding and function in tubular magazines. Traditional hollow points provide good performance at modest velocities. They can, however, expand too quickly upon target impact, sacrificing precious penetration, especially at the higher velocities produced by lever action firearms. Hornady FTX solves this problem. 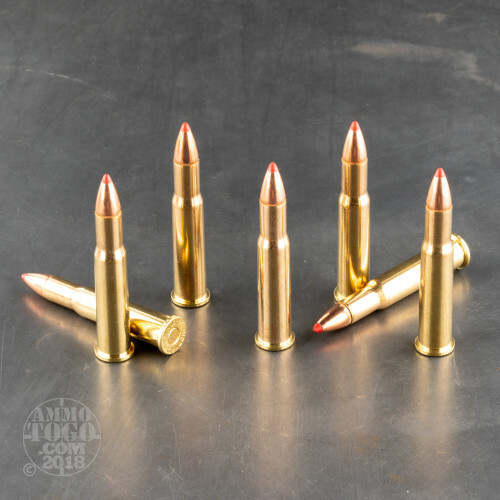 Packaged in 20-round boxes, this ammunition is non-corrosive, boxer primed, and features quality brass cases. Manufactured using modern propellants, each round produces a muzzle velocity of 2400 feet per second with 2046 foot pounds of muzzle energy. Innovative LEVERevolution FTX bullets may require a newer magazine follower to provide optimum functioning of the last round in certain guns. Im not a hunter but have always enjoyed target shooting at long ranges. My Uncle started taking me to the out door ranges when i was a teen. Im almost 50 now and like to think im a pretty good shot. I have a Ruger mini-30 (7.62x39) a Remington 308 bolt action, and a model 96, 1960 Winchester 30:30 and its got the shortest range of the 3 rifles i mentioned..
Having said that, these rounds really changed the game on the range and flight characteristics of regular 30:30 ammo. It increases your range to about 250yds maybe a bit more if your good enough and the wind is kind to you...(this is at a range shooting from prone). I'm also one of these guys that made a special mount to hold a scope on the 30:30. Its top eject so the scope sits forward. (Ive been a machinist for 30 yrs and made my own mount...and no i didnt drill into the gun...it's a mint, pre 1964 model 96...im not crazy). Bottom line...i love this round. I know there will be doubters on the 250yrd range i have experienced.. Non the less this has been my experience with this ammo and my 30:30. There is no doubt that this is the hardest recoiling round I've put through my 336. But it's also the least affected round I have in this caliber by the wind. Best 3 shot group out of 5 was under 1.5" @ 100 yards. Not to bad with just some air soft pellets stuffed in zip lock bags. Shooting a marlin 336 xlr.